This will sound self-contradictory and bring consolation to absolutely no one, but the facemask call that extended the game and gave the Packers the chance to win on a hail mary was the wrong call—and one that no official should be blamed for making. 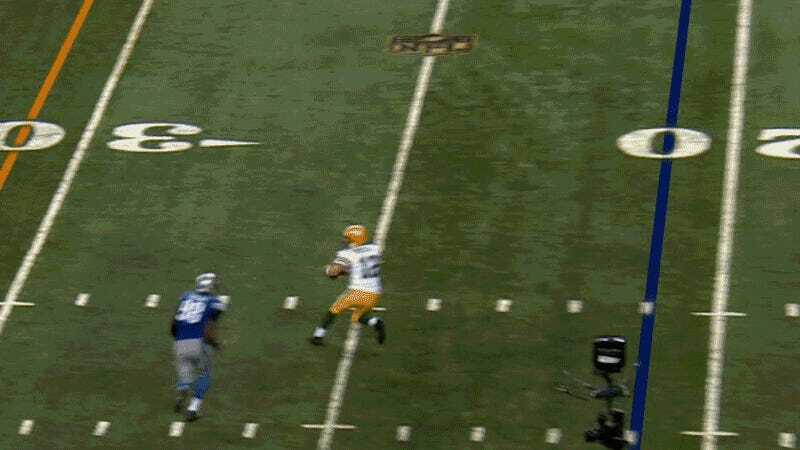 On a chaotic lateral-filled play, with the clock reading zeros, the ball ended up back in Aaron Rodgers’s hands. Rodgers dodged as DE Devin Taylor reached out to bring him down, and Taylor’s right hand made contact with Rodgers’s mask. Rodgers’s helmet jarred, his head turned to the right, and he was wrenched to the ground, chinstrap dislodged. When you watched it in real time, you thought it was as obvious a facemask penalty as you’d ever seen. Veteran head linesman Kent Payne thought it was just as obvious. He threw his flag and gave the Packers one more play. Only here, zoomed in and slowed down to a clarity far beyond the ken of any human, did it become clear that Taylor hadn’t grabbed Rodgers’s facemask. He struck it with his thumb, it appeared, perhaps just past the first knuckle, then slid off and took Rodgers down by his shoulder pad. But what was the official supposed to do? He didn’t have access to the replay, and the NFL’s head of officiating said that Payne made the right call given the information he had available, i.e. his view of what looked for all the world like the Platonic ideal of a facemask penalty. Here we have the heart of the debate over NFL instant replay—a play where the truth only becomes apparent through the use of technology, actions measured in milliseconds and impenetrable by humans’ visual processing capabilities. It’s the same disconnect that leads to the NFL’s inability to properly define a catch, and leads to discussions over whether more—or zero—types of plays should be reviewable, and it’s a legitimate epistemological question. Which is true? The thing we saw, or the granular, artificially enhanced, retroactive display of what actually happened? And in a football game, what defines what’s true, if not the the necessarily limited and subjective knowledge of the officials who are specifically awarded the power to interpret observed actions and whose rulings are for all intents and purposes perception made fact? This is a lot of highfalutin talk to say the Lions were unlucky. 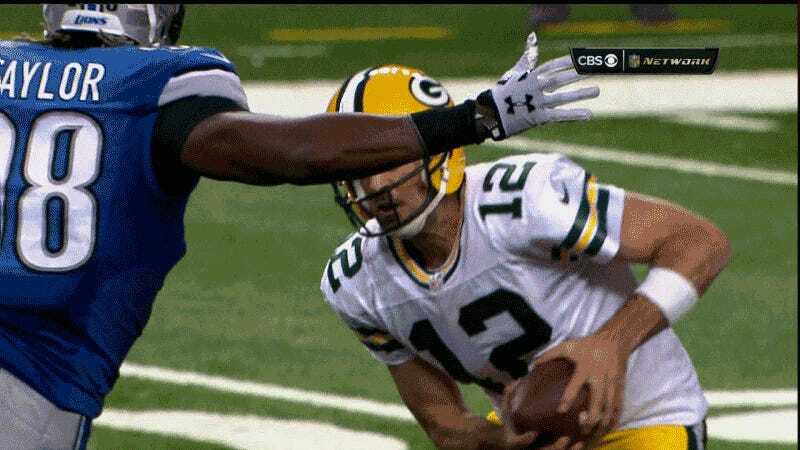 Devin Taylor didn’t grab Aaron Rodgers’s facemask. But through no fault of his own, it sure as hell looked like he did to everyone watching. That’s the unsatisfying truth.